There was a time when it needed a glib phrase on a multi-coloured poster to attract the paying customer to a wrestling match. ‘Maulers of the Mat’ was one such well-worn description that was used to encourage the passer-by to watch the strong men in action. The television camera has done much to dispense with the need for teasing approaches of this kind. For as the weekly fare of wrestling bouts, broadcast from centres all over Britain, has become more and more a regular Saturday afternoon viewing habit, so the uninitiated spectator, sitting in the comfort of his own sitting-room, has come to learn that this is not just an exhibition of brute force, accompanied by grunts and groans, but, in fact, is a highly specialised business, where an above average degree of physical fitness, a fleetness of foot, a good eye — not forgetting a definite hint of showmanship — are essential ingredients in the making of a good wrestler. Jack Dempsey tries desperately to free himself from a Bernard Murray leg-hold. Nothing is more revealing than the television camera. Let a wrestler fall below the standards now expected of him by the armchair enthusiast and he is quick to receive the derision of the millions who, nowadays, watch every wrestling programme which is televised. And by far the greatest majority of these viewers are women. ATV producers who supervise the transmission of many of these broadcasts admit to being mystified by the appeal of this type of programme to women. One has tentatively ventured the reason as being ‘because they like seeing these great torsoes throwing each other around.’ Others lack his temerity in offering an explanation and keep quiet. But there is no denying the appeal — as the large mail addressed to ATV when an exciting bout is cut off in mid-stream testifies. Here again, the majority of the letter writers are women. As the sport has grown in appeal, so it has thrown up its characters — and its specialists. Commentators Kent Walton and Peter Cockburn, from their seats at the ringsides, Saturday after Saturday, must now be regarded as among the most knowledgeable of wrestling followers in this country. 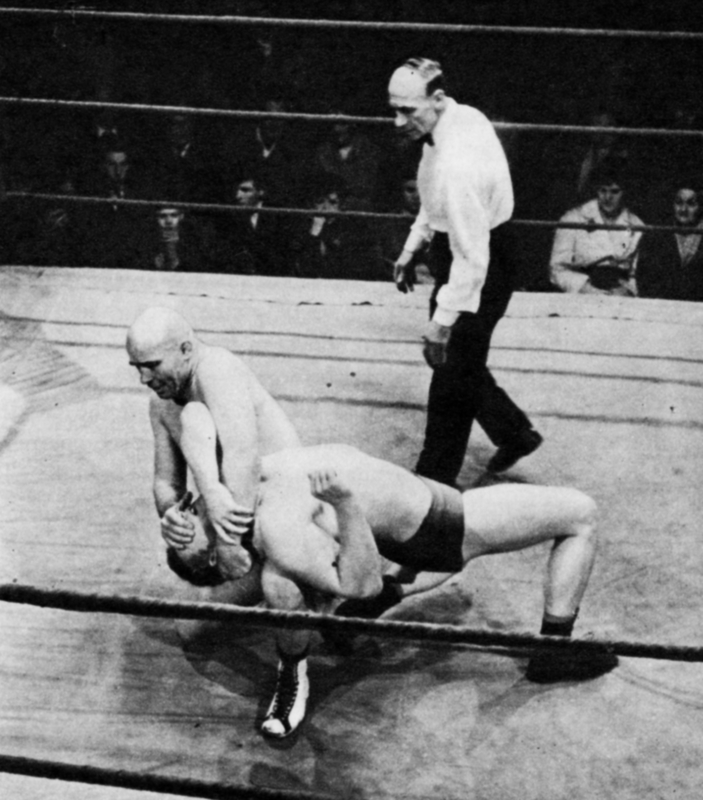 While they describe the action in the ring, pin-pointing by name the holds and the falls, so they also have at hand the expert assistance of such exponents from the world of wrestling itself as Ian Campbell and Tony Mancini, both of whom can provide for the viewer more technical reading of a bout as it takes place. Campbell and Mancini know wrestling intimately from the inside. Both have been seen by television viewers in action in the ring. Mancini, with his panther-like grace and speed of striking; the bulky, bearded Campbell, using his tremendous strength and his Scottish canniness to mislead and antagonise his opponent — and, not infrequently, the spectators who are watching him! But it is the regular, top-of-the bill names who have now moved into that select company known as ‘TV personalities’. Befitting their emergence as popular television favourites, wrestlers of today bring a touch of colour and the suggestion of distant lands in their names, in their flamboyant dressing-gowns, in their peculiarly personal preparations in their corners as they limber up before coming out for the first time to meet an opponent. Such colourful personalities include the Mohawk Indian, Billy Two Rivers; the West African witch doctor Massanbula; Antonio Mantoro, who hails from Valencia, in Spain; a Sheffield miner who fights under the pseudonym of Young Vulcan; Togo, a 16-stone wrestler from Japan, and Mike Narino, who brings to his wrestling the dash and fire expected of someone born in sunny Italy. All have become firm favourites with television viewers. Some have gained their following by their sportsmanship and by the expert manner in which they handle themselves — and their opponents — in the ring. Others cut a fine figure, muscles rippling, the embodiment of supreme physical fitness, as they circle an opponent, waiting to get to grips with him. Such a wresler is Dennis Mitchell from Bradford. With his fair hair crew-cut, and always sporting spotless white trunks, he attracts probably the greatest fan mail of any wrestler who appears regularly in televised wrestling matches. 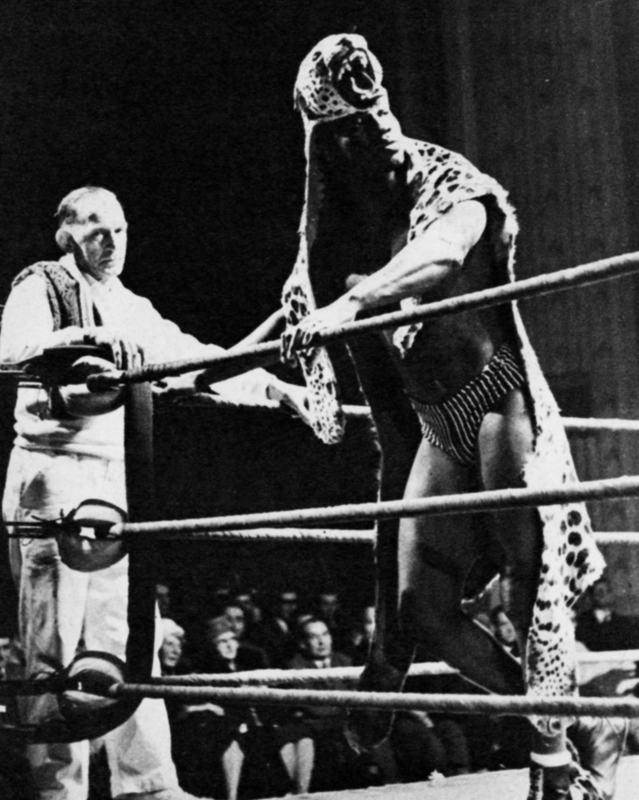 Nigerian wrestler Massanbula clad in the leopard skin he always wears to the ring. Peculiarities of dress and style in the ring have become the wrestler’s trade mark. Big Joe Cornelius has very definite views, for instance, on the colour of the tights he wears when fighting. His choice is always black. But his real trade mark is a striking gold lame dressing-gown. He would not dream of appearing in a ring, prior to his introduction to the crowd, unless he was wearing it. But the brilliance of Cornelius’s pre-fight apparel fades before the feathered head-dress and painted robes and regalia worn by Billy Two Rivers when he strides down the aisle towards the ring, heralded, as always, by a fanfare. Ducking through the ropes, he performs a few shuffling steps taken from an Indian war-dance. Part of a war-dance is also to be found in one facet of his wrestling technique. And it is invariably followed by the ‘Tomahawk’, a chopping hand blow, usually adminstered as his opponent rebounds from a throw on to the ropes of the ring. Togo brings the quiet dignity of the East to his ringcraft. This Tokyo-born exponent of Karate (the science of fighting with hands, without using weapons) has endeared himself to wrestling enthusiasts by his habit of bowing to the crowd after every fall, whether taken by him, or scored by him. He repeats the bow at the end of every fight — again irrespective of whether he has won or lost. And these fighters are not without their academic distinctions. If Mike Marino, with his ability to speak five languages, once thought he had the edge — linguistically — over his fellow wrestlers, he had to bow to the coloured American, Ray Apollon, who can speak seven languages and has a science degree from a Paris university to boot! Billy Howes is a demolition expert in his home town of Bristol. His hobby is breeding bull mastiffs. But Hungarian Tibor Szakas must have thought him more like a terrier when they clashed in one of the most memorable meetings to be staged in Wembley Town Hall, the setting for some of the best afternoons of wrestling seen on television. Wembley has the reputation of disliking someone who should, in fact, be one of her favourite wrestling sons. He is Jackie Pallo, dubbed this year ‘Mr. TV’. He is always assured of a barrage of catcalls and shouts of disapproval when he climbs in through the ropes at a Wembley Town Hall promotion. In fairness to the fair-haired Jackie it must be recorded that in Huddersfield, over a hundred miles from home, he is very popular with the crowds. A typical Saturday afternoon scene. Johnny Czeslaw gets the best pf this tussle with Bob Sweeney. If Pallo is the man they dislike at Wembley, then the man ‘they love to hate’ everywhere is short-cropped Mick McManus, the welterweight, who delights in infuriating his opponents and spectators alike with his feints, concealed handshakes and strutting, arrogant postures, while he shouts defiance at everyone — in the ring and outside it. Who among those who watch television wrestling as a regular habit can forget the classic meeting of Pallo and McManus on the afternoon of this year’s F.A. Cup Final. For weeks the two had been snapping at each other, anxious to meet in the ring, each determined to lower the others colours, once and for all. The bout was indeed a needle match. From the first bell both wrestlers gave everything they had. No quarter was asked; none was given. Every trick of the book was produced; every hold tried and found to be wanting. When the final bell went both men were out on their feet. The result: a drawn bout — and the money side-stake went unclaimed. This fight had everything the wrestling fan wants: excitement, thrills, technical ability, skill and showmanship. If you are a devout follower of wrestling no more need be said. It’s Eleventy One by the Mike Vickers Orchestra.